It's hard to justify wasting an inch of deskspace on a clock when your watch, your phone, your computer, even the coffeemaker can tell you what time it is. But then you lay your eyes upon the O'Clock from Okum Made and realize there's still a place for traditional time tellers. At least ones that look this good. Made from a solid block of walnut, maple, douglas fir, or cork, the O'Clock ranges in price from $85 to $98 depending on the type of wood that suits your fancy. 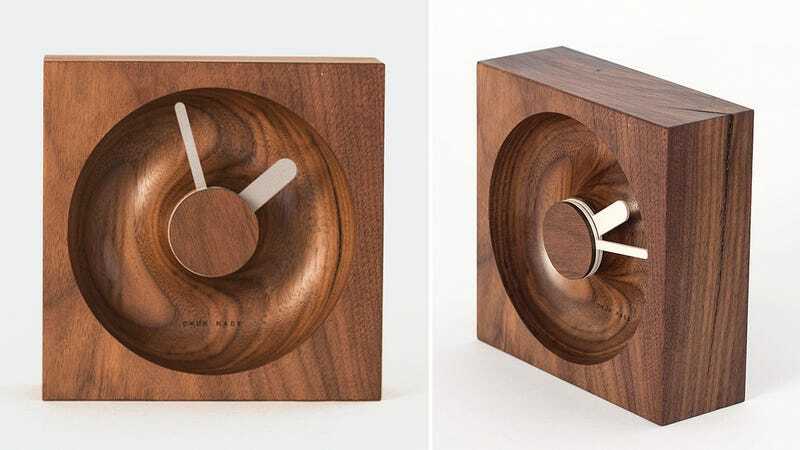 The half donut-shaped recess that represents the clock's face is carved using a bowl-nosed drill bit, while a set of simple wooden hands complements the aesthetic.